A4 School Graph Maths Square Pixel Grid Premium White Paper Pad 80 Sheets x 4 by Student Solutions at LDP Graphic Design. MPN: S2835361. Hurry! Limited time offer. Offer valid only while supplies last. Student Solutions A4 Graph Pad 80 Sheets x 4. A4 white graph paper on every page. Standard graph 2 : 10/20mm size. Hole punched to fir ringbinders. 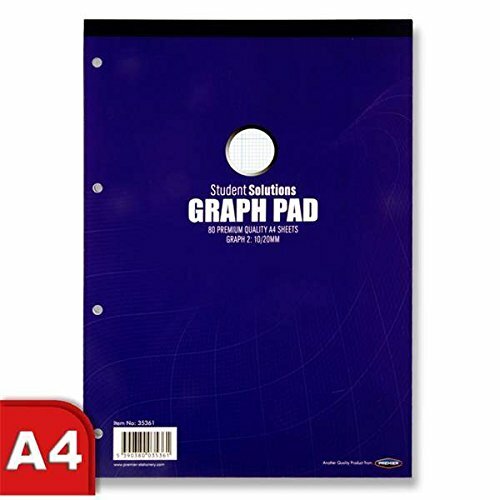 Student Solutions A4 Graph Pad 80 Sheets x 4. A4 white graph paper on every page. Standard graph 2 : 10/20mm size. Hole punched to fir ringbinders. Ideal for home, office and school use. Special offer below recommended $ RRP.